The Global Volcanism Program has no activity reports for Krasheninnikov. The Global Volcanism Program has no Weekly Reports available for Krasheninnikov. The Global Volcanism Program has no Bulletin Reports available for Krasheninnikov. 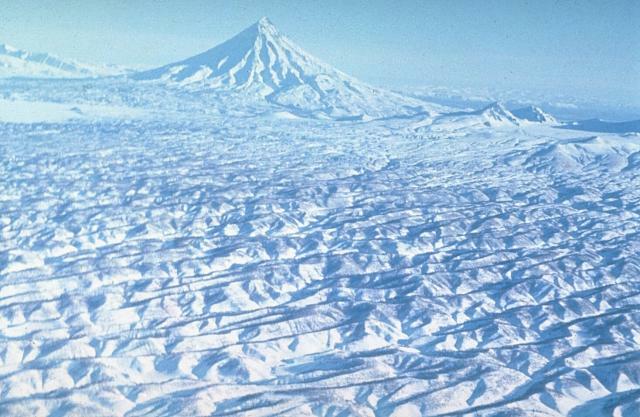 The late-Pleistocene to Holocene Krasheninnikov volcano is comprised of two overlapping stratovolcanoes that were constructed within a 9 x 11 km Pleistocene caldera. Young lava flows from summit and flank vents descend into the caldera and down its outer flanks. The summit cones are situated along a NE-SW-trending fissure that has also produced zones of Holocene cinder cones extending 15-20 km beyond the caldera. Tephra deposits from the caldera-forming eruption directly overlie a 39,000 before present (BP) tephra once thought to be related to that eruption but now thought to be associated with the formation of Uzon caldera (Florenskii 1988). Both the Southern and Northern cones are topped by 800-m-wide craters; the younger Northern Cone was constructed within a 2-km-wide caldera. Construction of the Southern Cone began about 11,000 years BP and lasted for about 4500 years. The Northern Cone was constructed during a cycle of similar length that began about 6500 years ago. The present eruptive cycle began about 600 years BP, but has included only two documented eruptions, the last about 400 years ago. Ponomareva V V, 1987. 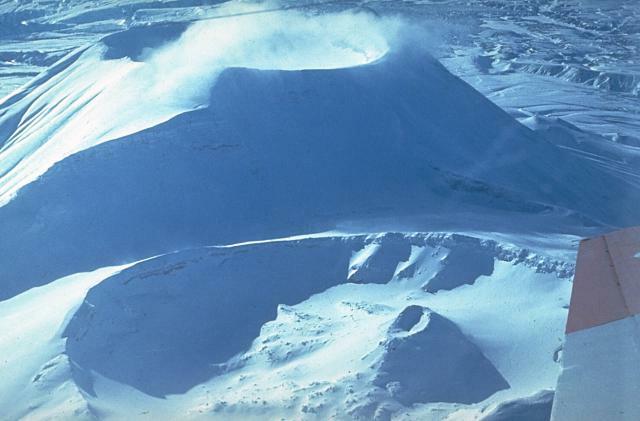 The history of Krasheninnikov volcano and the dynamics of its activity. Volc Seism, 1987(5): 28-44 (English translation 1990, 9: 714-741). Ponomareva V V, Braitseva O A, 1990. Volcanic hazards for the area of the Kronotsky Lake - Uzon, Geizerny Valley. Volc Seism, 1990(1) p 27-44 (English translation 1991, 12: 42-69). Ponomareva V V, Tsyurupa A A, 1985. Extended liquid acidic lava flows at Krasheninnikov volcano. Volc Seism, 1985(3): 85-92 (English translation 1988, 7: 447-458). Volynets O N, Ponomareva V V, Tsyurupa A A, 1989. 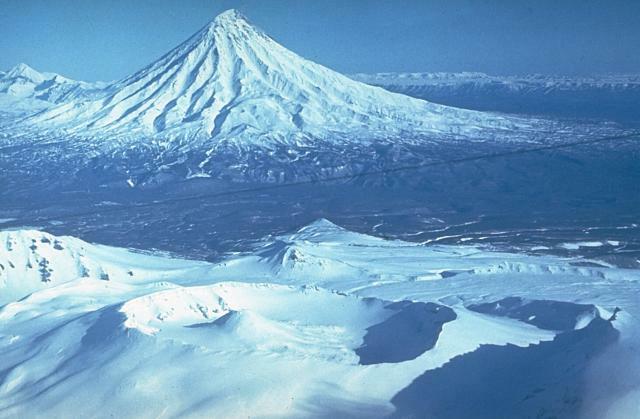 Petrological and tephrochronological studies of Krasheninnikov volcano, Kamchatka. Internatl Geol Rev, 30: 1107-1122. There is no Deformation History data available for Krasheninnikov. There is no Emissions History data available for Krasheninnikov. Krasheninnikov volcano is comprised of two overlapping stratovolcanoes seen here from the north. Both the Southern and Northern cones are topped by 800-m-wide craters. Construction of the Northern Cone began about 6500 years ago. An inner Northern Cone was built within a 2-km-wide caldera, whose rim forms the scarp at the left. A small lava cone that occupies the inner crater of the Northern Cone (bottom) was formed during the last eruption, which took place about 400 years ago, and also produced a SW-flank lava flow. Photo courtesy of Anatoli Khrenov, 1989 (Institute of Volcanology, Petropavlovsk). 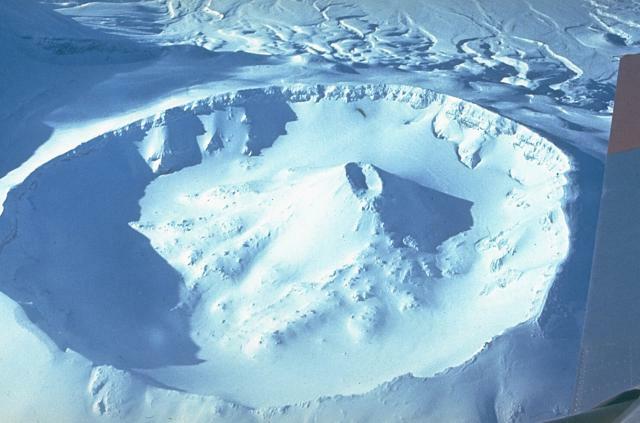 The circular, 800-m-wide crater that truncates the Northern middle cone of Krasheninnikov volcano was formed during an explosive eruption about 800 years ago. This view looks from the east across the crater of the Northern middle cone, which began forming about 1300 years ago. The latest eruption from Krasheninnikov took place about 400 years ago. It formed the small Pauk lava cone (left center) within the summit crater of the Northern middle cone and also produced a lava flow from a vent on the upper SW flank of the Southern cone. 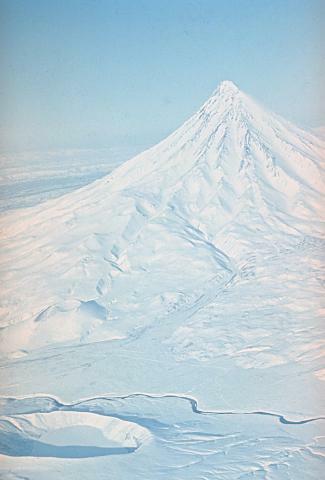 The Northern (bottom) and Southern (top) cones forming the summit of Krasheninnikov volcano were constructed within a 9-km-wide late-Pleistocene caldera. The Southern cone began forming about 11,000 years ago and the Northern cone about 6500 years ago. 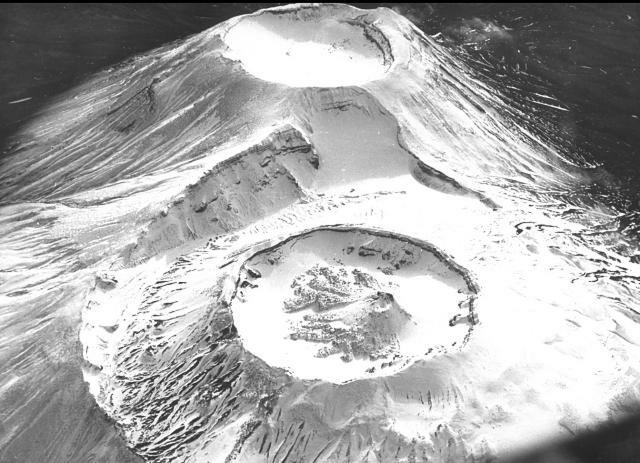 Both cones are truncated by 800-m-wide craters; the northern crater formed following an explosive eruption about 1100 years ago. The latest eruption of Krasheninnikov produced the small lava cone (lower right) in the summit crater of the Northern cone. Large Eruptions of Krasheninnikov Information about large Quaternary eruptions (VEI >= 4) is cataloged in the Large Magnitude Explosive Volcanic Eruptions (LaMEVE) database of the Volcano Global Risk Identification and Analysis Project (VOGRIPA).